Payments offered to rice farmers who entrust sales of this year’s harvest to agricultural co-operatives have been showing unprecedentedly low levels. Cross trading prices for rice sold to wholesalers are also set at low levels, as private inventory levels remained high for two consecutive years, loosening the supply-demand balance in the market. Reflecting the aging society and spread of healthy eating habits, many restaurants and takeout food manufacturers are reducing the amount of rice per serving, contributing to further decline in rice consumption. The amount of money given to producers of this year’s rice harvest was JPY1,500 to 3,000 lower per 60 kg from a year before, breaking the previous record low level. The amount was below JPY10,000 per 60 kg for most brands. The price for some brands dropped as much as 30 percent compared with last year. 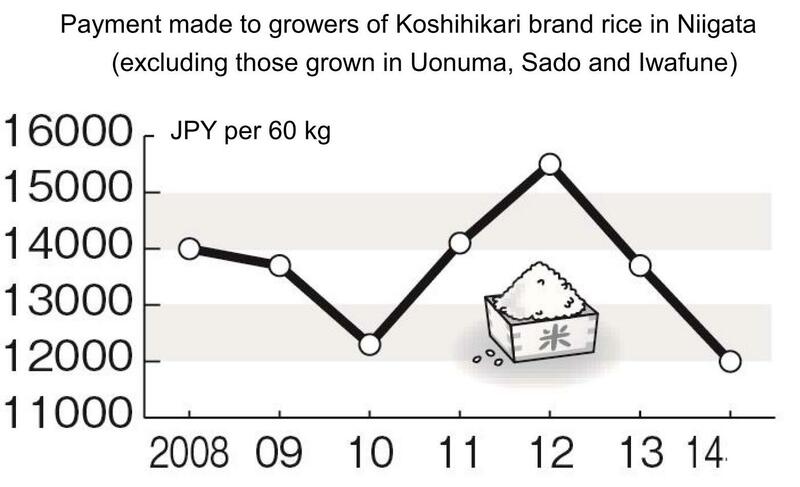 The payment made to growers of Koshihikari brand in Niigata Prefecture (excluding those grown in Uonuma, Iwafune and Sado regions), which is regarded as an indicator for nationwide rice prices, was JPY12,000 per 60 kg this year, down JPY1,700 from the previous year. It was JPY3,500 lower compared with the amount paid in 2012, when rice prices soared due to worries over rice supply following the Great East Japan Earthquake in 2011. The payment dropped below JPY10,000 even for the popular brand of Koshihikari grown in certain regions. Prices negotiated between rice growing regions and wholesalers are also decreasing. The standard price set by the National Federation of Agricultural Co-operative Associations (JA Zen-Noh) was JPY12,500 per 60 kg for Koshihikari harvested in the Kanto region and western Japan. In the Hokuriku region, the price was JPY13,000, some JPY1,000 lower than the previous record low price marked in 2010. 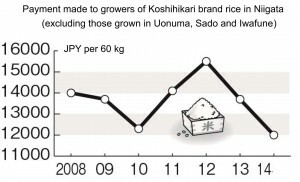 The decreasing trend of rice prices can be seen also in the market for wholesalers operated by Nihonkomeshijo Co. The average contract price in August – the month when marketing of rice harvested this year began, occupying roughly half of total trading – was JPY10,732, the lowest since the company began releasing prices in fiscal 2006. The market for rice harvested this year is already showing signs of price declines, with some brands marketed at a price of less than JPY10,000 per 60 kg. The trend of low prices is attributable to high inventory levels marked in 2012 and 2013. 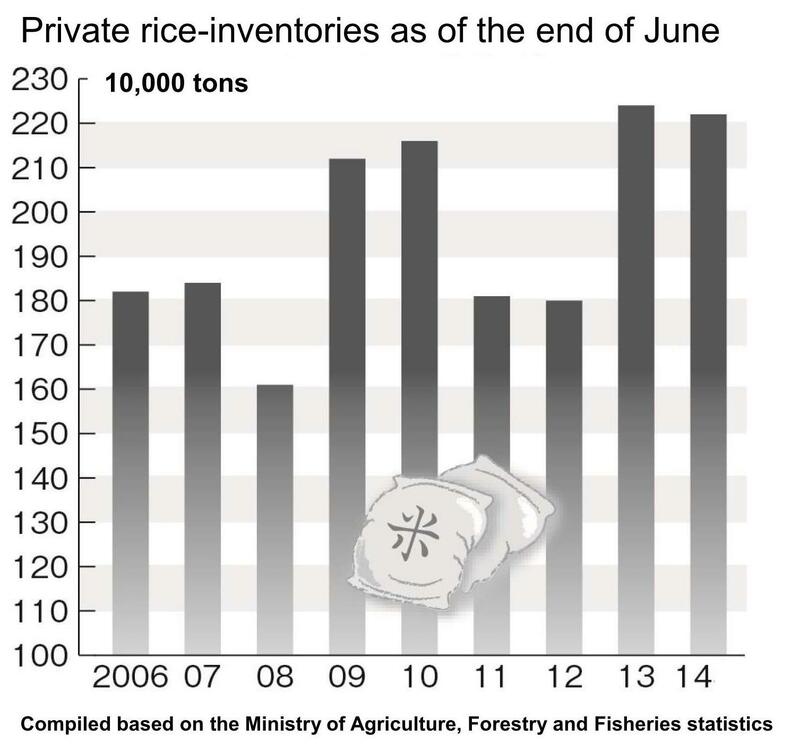 Private inventories as of the end of June, which affect the supply-demand balance of rice, amounted to 2.24 million tons in 2013 and 2.22 million tons in 2014. Private inventories topped the 2 million ton mark for two consecutive years for the first time since 2009 and 2010. Rice harvested in 2010 also marked a large drop in prices due to worries over excessive inventories. As for rice harvested last year, Beikoku Kiko, an institution established by the rice industry to stabilize rice supply, purchased 350,000 tons of rice to help reduce the excessive supply of rice for human consumption. However, such purchase is not scheduled so far this year. Some rice dealers say they cannot expect the government to take measures to adjust the excessive supply of rice harvested this year. This is because the government is working on encouraging rice farmers to shift to cultivation of rice for livestock feed, amid declining demand for rice for human consumption. Since rice growing regions cannot depend on purchases by Beikoku Kiko, they have to look for new customers, but there is no guarantee that newly harvested rice is advantageous in the market, as some food producers say they care more about the quality and price of rice than when it is harvested. Many predict that the inventory of rice harvested last year will amount to some 100,000 tons as of the end of October. It is necessary to sell out last year’s rice before selling this year’s rice, and competition between the two is likely to intensify. More and more restaurants and prepared food suppliers are beginning to serve smaller portions of rice in line with the aging of society and increasing awareness for healthy eating, the trend that is also regarded as a major reason for the decline in consumption of rice. 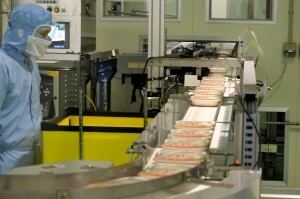 A worker inspects packages of rice on a conveyor belt at a sterile-packed rice factory. TableMark Co., the largest supplier of sterile-packaged rice based in Tokyo’s Chuo Ward, introduced a 180-gram package for its main product line this fall for the first time. The firm’s standard product size was a 200-gram package, with smaller packages offered only for certain premium rice brands. The company’s survey conducted on consumers over the appropriate portion of rice showed that the amount of rice people eat per meal or the size of rice bowls they use is getting smaller every year. The result prompted the firm to develop products with smaller portions. A separate survey by Beikoku Kiko, an industrial institution established to stabilize rice supply, showed a similar trend. Production of sterile-packaged rice has been growing in the last three years due to the increase of smaller portion packages between 150 and 180 grams. Although such products occupy only about 10 percent of total production, they marked a 10 percent year-on-year rise in fiscal 2013, thanks to the popularity of small portion packages. Also in the convenience store industry which consumes roughly 300,000 tons of rice a year, the size of box lunches and rice balls are getting smaller. According to the box lunch promotion association set up by the industry, the portion of rice in convenience stores’ major box lunches decreased by 10 to 40 grams in 2013 compared with some 250 grams in 2003, while the size of rice balls dropped by 10 grams in 2013 compared with some 120 grams a decade before. The association analyzes that the sizes of the products shrank as the range of convenience store users widened. Producers of prepared meals are reducing the amount of rice in each product apparently to correspond to the increase of elderly consumers and health-conscious people. Yoshinoya Co., a major fast food restaurant chain offering beef bowls, also reduced the amount of its regular serving of rice in 2012 for the first time in about 60 years. In 2013, it introduced a new menu of beef bowl with less rice and more meat, further expanding its lineup of dishes with smaller portion of rice. The company explains that it included such products in its menu to respond to the recent increase of requests by customers asking for large servings with less rice. This entry was posted in Cooperatives, Food & Agriculture and tagged Feature. Bookmark the permalink.